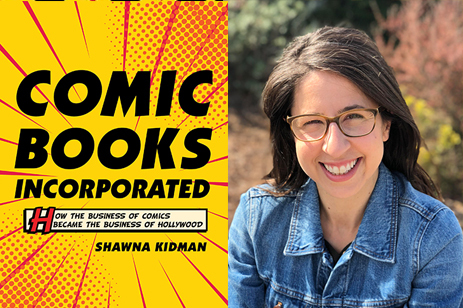 Congratulations to Dr. Shawna Kidman on the release of her book, Comic Books Incorporated: How the Business of Comics Became the Business of Hollywood, by University of California Press. Comic Books Incorporated tells the story of the US comic book business, reframing the history of the medium through an industrial and transmedial lens. Comic books wielded their influence from the margins and in-between spaces of the entertainment business for half a century before moving to the center of mainstream film and television production. This extraordinary history begins at the medium’s origin in the 1930s, when comics were a reviled, disorganized, and lowbrow mass medium, and surveys critical moments along the way—market crashes, corporate takeovers, upheavals in distribution, and financial transformations. Shawna Kidman concludes this revisionist history in the early 2000s, when Hollywood had fully incorporated comic book properties and strategies into its business models and transformed the medium into the heavily exploited, exceedingly corporate, and yet highly esteemed niche art form we know so well today. Dr. Kidman’s research and teaching focuses on the media business and examines how corporate, legal, and financial systems shape our entertainment landscape. Using business and legal history, communication theory, and cultural studies, Dr. Kidman works to contextualize and historicize media texts and practices. In looking at the structural interdependence of different media industries and different media cultures, her works takes a trans-industrial approach to the field of media studies. Congratulations on your newest publication, Dr. Kidman!